We love to shoot our wedding couples as they stroll off "into the sunset". Its very symbolic as the shot becomes a metaphor for the start of their journey through life together. 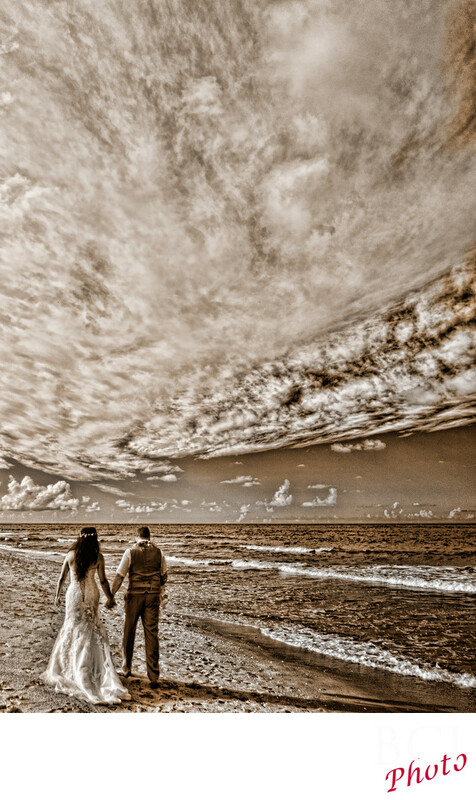 We've had this shot from a variety of brides appear in print on the cover of Treasure Coast Brides Magazine, not to mention on album covers, and even wall prints as the emotion shines through reminding the couple of their big day at the beach. Also featured in this particular rendition, we have converted the image to a chocolate toned monochrome, which really gives the image a timeless and romantic feel. A custom procession technique to enhance the details was also applied to further enhance the romantic feel of the image. If you'd love to have images like this captured for your wedding, just give us a call. It's what we do.